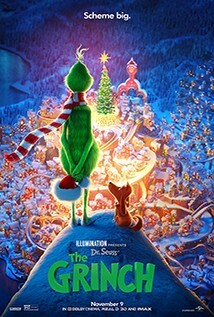 When the ‘Whos’ declare they are going to make Christmas three times bigger this year, the Grinch (Benedict Cumberbatch) realizes there is only one way for him to gain some peace and quiet: he must steal Christmas. To do so, he decides he will pose as Santa Claus on Christmas Eve, even going so far as to trap a lackadaisical misfit reindeer to pull his sleigh. Meanwhile, down in Who-ville, Cindy-Lou Who-a young girl overflowing with holiday cheer-plots with her gang of friends to trap Santa Claus as he makes his Christmas Eve rounds so that she can thank him for help for her overworked single mother. As Christmas approaches, however, her good-natured scheme threatens to collide with the Grinch's more nefarious one. Will Cindy-Lou achieve her goal of finally meeting Santa Claus? Will the Grinch succeed in silencing the Whos' holiday cheer once and for all?